This blogpost will be focused on discussing the various traceable African influences in the Gullah language which are quite wideranging and diverse. Similar to the famous Gullah craft of sweetgrass basket weaving it seems that the Gullah themselves have richly intertwined origins hailing from several parts of West & Central Africa. The same goes of course for almost all Afro-diasporic groups who are also mixed in between many African regions & ethnic groups. Ancestral locations within western Africa will generally speaking be the same ones but the relative share of specific ethnic groups in the overall ancestral mix might vary. This is showing up very clearly in the screenshot i posted above. The Gullah language received contributions from all the major Niger-Congo language groups, just like the other Anglo-Caribbean Creole languages, but Gullah is the only English-based Creole language with a plurality of either Mande or Bantu contributions in its lexicon. (Gullah is mentioned twice with a separate count in the chart above because “31: excluding items used only in stories, songs and prayers, which are for the most part of Mande origin.” (Parkvall, 2000, p.110). “The Gullah language is spoken today by about 250,000 people in coastal South Carolina and Georgia.” See also this Wikipedia article which has a useful list of suggested reading. Gullah is the only remaining English-based Creole language in the USA. Aside from Afro-Seminole Creole, which is considered to be a “dialect of Gullah”. For a full overview of English-based Creole languages see this Wikipedia article. Two main features of Atlantic Creoles are the socalled lexifier language, which provides the greatest part of its vocabulary aspect, this would be English for Gullah. And also the socalled substrate languages, African ones in case of Gullah, which may provide fewer recognizable lexical items but also had influence in other linguistic domains such as syntax, phonology, morphology etc. 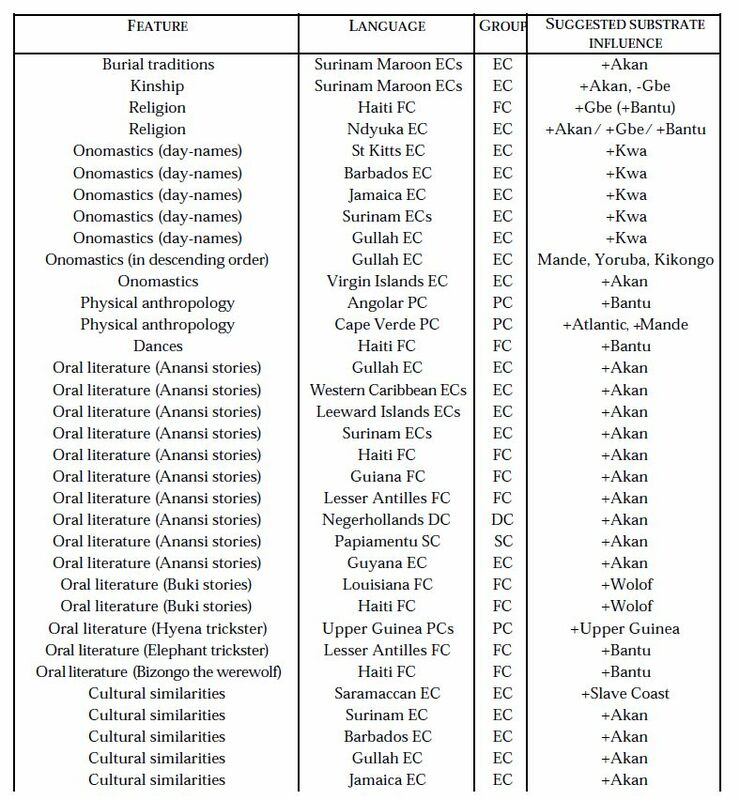 The chart and quote i opened this blogpost with are taken from an excellent study comparing various Atlantic Creole languages: “Out of Africa: African Influences in Atlantic Creoles” (Parkvall, 2000). Describing both similarities and differences between the languages retained/created by the Afro-Diapora. Very useful to get a better grip on which specific African regions/ethnic groups could possibly have been more significant (but not unique!) for each nationality/subgroup within the Afro-Diaspora. It’s important to keep in mind that the search for Africanisms is very much an ongoing research effort and the chart posted above merely represents the state of knowledge circa 2000! Based on more recent research a different overview could very well be possible. Below follow some more words of caution and a concluding remark from Parkvall (2000). Confirming slave trade statistics ? If we compare the first chart taken from Parkvall (2000) with the above table generated from the Slavevoyages Database the same patterns of Upper Guinean & Central African primacy seem to be replicated. The relative Upper Guinean predominance for South Carolina/Gullah when measured by counting the number of lexical items for Atlantic + Mande (53% or 40%) is mirrored by the relative share of Senegambia + Sierra Leone + Windward Coast (40%) in slave trade statistics. The Anglo-Caribbean colonies receiving clearly far fewer captives from the Upper Guinean region than South Carolina (see this page for maps & background info). This goes especially for Senegambia; for the Dutch Guianas (several English-based Creoles are spoken in Surinam, e.g. Sranan), it seems to have been almost inexistent. 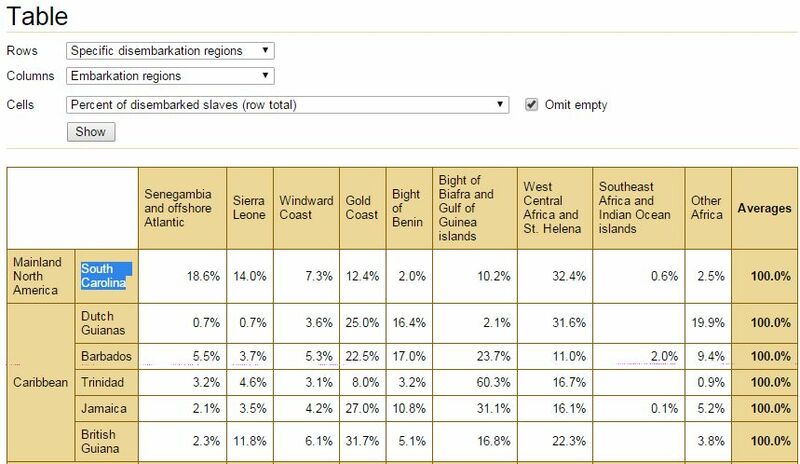 But the Windward Coast was a far more significant source of slaves for Surinam than shown in this chart (it’s hiding under 19,9% “Other Africa”). Also the Central African proportion is being shown as more prominent for South Carolina than for other English colonies, both linguistically (“Bantu” = 31%/39%) and through slave trade (“West Central Africa” = 32,4%). Eventhough Surinam comes close. Plus also for Anglo-Caribbean Creoles the Bantu component seems to have been significant, see for example: “Words of African Origin in Jamaican Patois“. Making the Upper Guinean proportion most distinct i suppose. The Gullah have been studied extensively because of their fascinating African cultural retentions, unique for the USA context. In upcoming blogposts i will go into deeper detail but for now i will just mention that it seems that 3 main lines of research have been established when it comes to primary origins within Africa for the Gullah which are in accordance with the previous findings. The first two combined being part of the socalled “Rice Coast” or “Black Rice” theory, which centers on the rice cultivating skills of captives from the wider Upper Guinean region being in high demand by South Carolina planters for whom rice was a major cashcrop. The Sierre Leone connection is probably most heavily publicized perhaps at times to the detriment of other major African origins receiving media attention. Especially by the efforts of anthropologist Jospeh Opala. For more details see also this well researched website: The Gullah: Rice, Slavery, and the Sierra Leone-American Connection. Plus these excellent documentaries: Family Across the Sea and The Language You Cry In. Senegambian muslims have been relatively well documented in historical sources for South Carolina & Georgia. There’s quite likely a reporting bias though as planters seem to have been overtly fascinated by them and took extra notice. Either way judging from both slave trade records and linguistical evidence their presence would have been substantial. For an excellent introduction see: “Muslims in Early America” and also “The Senegambian Roots of Gullah Culture“. Most recent research has focused on the numerous Central African and more specifically Kongolese presence in the South Carolina Lowcountry. From the slave trade records as well as linguistic analysis their major influence seems to be undeniable. However the general public might be least familiar with their connections to the Gullah. An extensive study from 2012 being: “African-Atlantic Cultures and the South Carolina Lowcountry“. An earlier online article from the same author: West-Central African Nature Spirits in the South Carolina Lowcountry. Given the above it’s intriguing that the Gullah language seems to be very similar to the Krio language from Sierra Leone. However this connection may have been caused (partially) by a reversed Atlantic flow of people: the Black Loyalists from the Thirteen colonies who were among the first settlers in Freetown. Quite possibly they would have spoken a proto-version of Gullah. Although there’s also other theories about an English-based Creole/Pidgin language already existing in Gambia/Sierra Leone and being brought over to the Americas (Parkvall, 2000, p.156). It’s also interesting to note that the word ‘Gullah’ itself has been explained using either an Upper Guinean origin (the Gola from Liberia) or an Central African one: Gullah most likely being derived from Angola which was a geographical term used differently in the colonial period from nowadays. Unlike the Portuguese the English seem to have referred mainly to locations to the north of the Congo river or at least to the north of the main Portuguese settlement Luanda when using ‘Angola’. Referring more specifically to mainly Bakongo people. See also the West-Central African Maps page. The ‘Angola’ explanation seems to have won more votes in favour lately. Just for illustration i will show some partial screenshots of Anglo-Caribbean slave registers which i blogged about already (see this overview). Clearly demonstrating that the Gullah ethnonym wasn’t restricted to only the USA. Although showing up only in very few numbers and it seems peculiar that only in the South Carolina Lowcountry the Gullah name got preserved while the ‘Congo’ slave ethnonym, so dominant elsewhere, was relatively unheard of in South Carolina; instead ‘Angolans’ being more popular. More discussion on this topic in “Ethnic Origins of South Carolina Runaway Slaves“. Birthplaces of slaves Berbice (Guyana) 1819. Up till now we’ve only considered the lexical influence of African substrate languages on the Gullah speech. However applying other linguistic criteria the similarities between Anglo-Caribbean Creoles and the Gullah language become more apparent and might also have ancestral implications. These shared characteristics seem to hail mostly from Lower Guinea: the entire coastal area in between Liberia/Ivory Coast and Cameroon. See also this page for more background info on the Lower Guinea area. Going by lexical influence already a consistent primary Kwa contribution was found for all the English-based Creoles safe for Gullah. Extending the linguistical analysis brings to light more shared Lower Guinean connections, also for the Gullah language. These connections make sense when one considers that besides direct slave imports from Africa the USA also received many “seasoned” slaves by way of intercolonial trade with the Caribbean. This may have occurred throughout the slave trade period, but especially during the crucial early formative period of the late 1600’s/early 1700’s. In that sense it might be a founding effect which could also (cumulatively) have had a corresponding genetic consequence. All charts & quotes below are again taken from Parkvall (2000), which can be consulted when more detailed information is required on the linguistic feature being highlighted. Much of the present knowledge about the Gullah language and its African influences is based on the invaluable research done in the 1930’s/1940’s by Lorenzo Dow Turner. Because of his own African American background he gained the trust of the isolated Gullah communities who had been wary of other researchers in the past. His work was truely a breakthrough in the study of African retentions within the USA. Furthermore he contributed to a beginning of the celebration of African heritage instead of it being denied or looked down upon. No longer is the Gullah language considered to be “just a badly spoken English dialect”, instead its diverse African features are proudly acknowledged! These socalled ‘Africanisms’ making Gullah a distinct and valuable language connecting its speakers with their African origins and traditions which are still being maintained even when having evolved to their surroundings & history in the South Carolina Lowcountry. An even more detailed overview of Turner’s findings can be found in “The Gullah People and Their African Heritage” (Pollitzer, 1999). There’s a couple of standout percentages for Yoruba, Mende and Vai, but mostly when personal names and isolated stories are being considered. Going by everyday vocabulary it’s the Kongo language by far which is most contributing overall and also correspondingly high in personal names. While for sounds and grammar it seems to be Ewe and again Yoruba surprisingly. It’s also interesting to note that the Gbe influence (Ewe & Fon) is estimated to be higher than the Akan (Twi) influence, both language groups might have arrived via the Gold Coast/Ghana but could have left behind a differentiated genetic legacy. These quotes above might appear to be somewhat provocative but science always relies on critical questioning of established knowledge to gain more insights. Surely Lorand Matory did not intend to take anything away from the inherent qualities of Turner’s work. But given that Turner published his groundbreaking book more than fifty years ago, a reassessment based on an increased linguistic knowledge might be very useful. Especially when more native speakers are involved from both the Gullah side as well as the African source languages. The surprisingly high Yoruba influence identified by Turner might be one of his findings which could profit the most from an updated research effort. Given what we know about slave trade patterns to South Carolina (Bight of Benin representing a mere 2% of all slavevoyages) as well as the political history of the Yoruba (most enslavement took place after the break up of the Oyo empire in the early 1800’s) a high Yoruba impact seems to be quite puzzling or even unlikely. Unless we assume that illegal slavetrade to South Carolina taking place after 1807 and involving the Bight of Benin was more widespread than has been the consensus sofar. Again from Pollitzer (1999) this hugely interesting diagram below is showing how slave trade importations do not always correlate with linguistic influence. Especially when it comes to “Sounds and Grammar” the contributions of Bight of Benin and Bight of Biafra seem very much disproportionate. In the previous section “Shared Lower Guinean influences” i have already mentioned this could be due to a founding effect by “seasoned” slaves coming directly from the West Indies instead of from Africa. These “charter generation” slaves may have defined the main framework of the Gullah language. While the lexical or “words in conversation” contributions seem to be much more in line with later slave imports from especially Upper Guinea and Central Africa. Of course it could also be that some African influences were misidentified or misassigned. It is very interesting in this regard that recent research has established that slave trade from southern Sierra Leone (where Mendeland is located) only really got active after the abolition of slave trade in 1807 (e.g. see Misevich (2009)). See also this page “A SHIFT IN ETHNICITIES” from the very informative Abolition website. Before this period, in the 1700’s, most slaves from Sierra Leone would have been shipped via Bunce island in northern Sierra Leone instead and would have been mostly Temne, Susu, Limba, Fula, Bolom or Kissi. See also the Anglo-Caribbean Slave Registers where the Mende are mentioned only in very minor frequency. Most Mende captives were actually carried off to Cuba or Puerto Rico where they were known as ‘Ganga’, for example the ones on board the Amistad. However it’s known that South Carolina continued importing enslaved Africans to some degree after slave trade officially got abolished. So perhaps the period in between 1807-1860’s would indeed be the time Amelia’s Song could possibly have arrived among the Gullah. – Pollitzer, W.S. (1999). The Gullah People and Their African Heritage. – Turner, L.D. (1949). Africanisms in the Gullah Dialect. This entry was posted in African Americans, Anglo Caribbean, Gullah, Linguistics and tagged Creole, South Carolina. Bookmark the permalink. ← Jamaican maternal lineages trace back mostly to Ghana? This was a very good read, thank you! While the Yoruba was by no means a majority in the Gullah context, I do think the 2% documented slave voyages can be misleading. IMHO, I surmise the “standout” Yoruba contribution stems from Caribbean importations and the illegal slave trade. Even in Turner’s “Africanisms…” there is a sizable number (names) of specific Yoruba deities and priestly titles which are unique to that particular culture. Two percent, based on the time frame of slave voyages in question, wouldn’t seem to yield such retentions worth mentioning. I get the impression the Yoruba presence within Gullah cultural complex was recent – after 1808 forward. The Clotilde, the so-called last slave ship (1858), was a good example, as that a number of Nagos (“Yorubas”) were on that ship. I would estimate about 4 to 5 percent Yoruba enclave within the Gullah mix. Yes i agree the 2% documented Bight of Benin might underestimate the actual genetic/cultural contribution from this region. In those overviews of Turner’s findings he actually also identified considerable influence coming from the Fon and Hausa, both ethnic groups would also have been transported via the Bight of Benin and perhaps even a part of the Ewe who live along the Ghana/Togo border. I found it very interesting that the linguistic influence from the Ewe is estimated to have been higher than Twi/Akan. Hi Ezekiel, thanks for the comment! It is indeed striking (based on table 16). But like I mentioned in this blog post one has to keep in mind that the linguistic identifications made by Turner in his pioneering research do reflect the state of knowledge at that particular time (1940’s). Given that Turner published his groundbreaking book more than fifty years ago, a reassessment based on an increased linguistic knowledge might be very useful. Especially when more native speakers are involved from both the Gullah side as well as the African source languages. Frankly given how closely Bambara is related to the other Mandé languages, I wouldn’t be surprised if many of these words identified by Turner are actually not specifically Bambara but potentially hailing from various Mandé languages. By the way I do not think the Bambara were insignificant in numbers either. Especially when grouped together with other people from eastern Senegambia, Guinea and western Mali, they would have been a considerable group indeed! Have you read this blog post of mine as well?